Czech conductor. Born June 29, 1914 in Býchory near Kolín (Bohemia, former Austro-Hungarian Empire, now Czech Republic), died August 11, 1996 in Kastanienbaum LU, Switzerland. 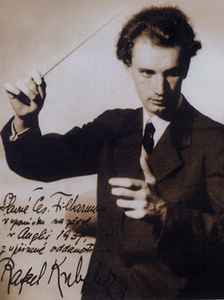 Emigrated in 1948, lived mainly in Switzerland and in the U.S.
Tchaikovsky* - Rafael Kubelik Conducting The Chicago Symphony Orchestra* Tchaikovsky* - Rafael Kubelik Conducting The Chicago Symphony Orchestra* - Symphony No. 6 In B Minor, Op. 74 "Pathetique"